With all the essential moving services, Meathead Movers get you safely into your new home. Our clean-cut student-athlete Mendota movers are dedicated to fulfilling all your moving needs to your satisfaction. Known as the Cantaloupe Center of the World, Mendota is a friendly, family-focused community located in California’s Central Valley. The town was first founded as a railroad storage and switching facility site, but today it enjoys a diverse economy driven largely by agriculture. Families moving to Mendota will find that recreation and sporting opportunities abound. Of course, working with the Mendota movers at Meathead Movers is the easiest way to make the transition to this bustling community. One of Mendota’s prime attractions is its park and recreation system. The city maintains four parks of its own, and other state and federal parklands surround the area. Among the most popular is the Mendota Wildlife Area, which is used for both bird watching and seasonal hunting. The city is also located less than two hours from beautiful Yosemite Park. The town is also well-known for its excellent youth sports programs. The city’s youth football team has won the Tri-County Championship and the area has also produced several state boxing champions. As a family-focused community, it is a great place for parents to watch their kids excel at sports while enjoying support from a tight-knit community. There are also great job opportunities in Mendota thanks to solar plants and a variety of agricultural companies. Families who choose professional Mendota movers will enjoy greater peace of mind knowing that we take care of the heavy lifting for you. At Meathead Movers, we’re proud to provide a full host of moving services to families throughout California. From local, long-distance, commercial, to on-site moves, Meathead Movers can help you with all of your moving needs. We can even help you start the process off right with our Princess Packers, who will carefully pack away even your most fragile possessions. In addition to offering the best in pre-moving services, our friendly moving concierge can help you adjust to your new home by connecting you with utility and service providers in your new area. All our student-athlete Mendota movers are thoroughly screened and trained before their first move. We are dedicated to making the most of your time, which is why we always jog when not carrying your belongings. 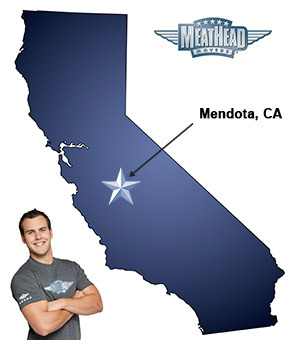 At Meathead, we’re proud to act as your Mendota movers of choice. We’re here to help you make the transition to your new home quickly and safely. With our 100% satisfaction guarantee, the only thing you have to lose is the stress that comes from moving! So contact us today for a free moving quote and to learn how we can help you on your next move! “Nice courteous kids with a wonderful work ethic. I really like the way they work with us to get things done the way we want. I didn’t know moving could be so efficient. Nice courteous kids with a wonderful work ethic. I really like the way they work with us to get things done the way we want. I didn't know moving could be so efficient. I will definitely recommend Meathead Movers to everyone I know.